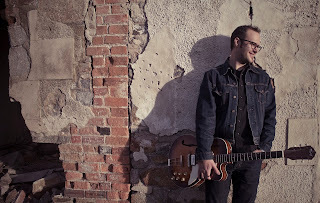 Pete Cornelius has squeezed a lot of musical experience into the past 20 years, since he took up the guitar at the age of nine. This Tasmanian bluesman released his first album when he was 13, and by the time he was 15 he had his own band, Peter Cornelius and the DeVilles. Working with this band, his other band (King Cake), and countless side projects, he must spend all of his time in the studio and on stage! For his latest album, Groundswell, Pete put together a new team of musicians and recorded most of the tracks live at his friend’s vacation house in Elephant Pass. Besides providing the guitars and vocals, Cornelius produced, recorded and mixed this CD. He is joined by the backline of Simon Holmes on bass and Henry Nichols behind the drum kit; other contributors include Randal Muir on the Hammond organ, Kelly Otaway on piano, and Susannah Coleman-Brown on backing vocals. Paul Williamson, Jeremy Williamson, Donald Bate and Lila Meleisa added their horns to the basic mix, giving this project a huge sound where it needed it the most. Groundswell starts strongly with an original track, “Drinking the Blues” which is not the expected paean to overindulgence of adult beverages. Though Cornelius is a guitar slinger of the highest order, he does not show off, and instead submits tasteful backing guitar and well-placed clean leads. The horns are well-arranged, and with the piano added in this spooky-sounding R&B number achieves a hearty blues revue mood. This and the other five originals were all written by Pete – he is a busy guy. The five covers that Pete selected for this disc are diverse, and when there are combined with his original songs no two tracks sound the same. This project is a refreshing blend of blues, country, funk and rock that confirms his separation from the current crop of uber-talented Stevie Ray Vaughn disciples. For example, Reverend Al Green’s “Love and Happiness” showcases Cornelius’ well-practiced vocals. His voice is strong and he sings with no trace of an accent (in case you were wondering). He doubles the organ with a few of his guitar licks, and cuts loose with a solo the likes of which you will only hear at the finest of blues jams. He follows this up with Otis Rush’s “Right Place, Wrong Time” which proves that his vocals are up to the task of taking on the most soulful of tasks. It was surprising to hear Tom Waits’ “Cold Water” on this playlist, but it fits in well with the amalgam of genres that are to be found here. There is a hard-rocking gospel feel that plays well off of Waits’ brilliant imagery of a man of the road who has a hard life but still gets by. This is the roughest-sounding track on the album, but this jaggedness lends a gloriously live feel and it turns out perfectly. 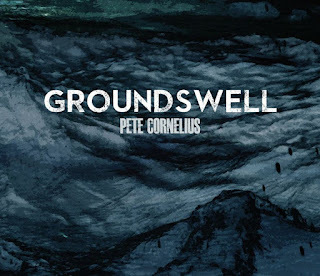 The most impressive re-do on Groundswell is Cornelius’ searing, eight-minute take on Ray LaMontagne’s “Repo Man.” A hefty dose of funk is injected into this song by Holmes’ bass and Muir’s Hammond while Cornelius finally lets his guitar take center stage as he plays a killer solo that is equal parts Hendrix, Clapton and Stevie Ray, with a few of his own twists mixed in. As good as these covers are, Pete displays great maturity in his own songwriting. These songs run the gamut from a sweet ballad for his young daughter (“Goodnight my Love”) to the Creole horns of “Talkin’ Bout New Orleans.” The standout track amongst his original work is “Strong Suit,” a roots tune with genuine lyrics, beautifully fingerpicked guitar, and heartfelt vocal harmonies. He chose to end the album with this song, which was a wise decision. Pete Cornelius has done more in the past two decades than most musicians accomplish in their lifetime, and Groundswell reflects his dedication to the blues and its related music forms. It is a top-notch album with both quality original material and a unique sound, and it is worth your time to give it a listen. We can only hope that he adds a tour of the states to his busy schedule, because it would be great to see these song performed in person!